Congratulations to Kerry Lamond who has won the Anne Boleyn B necklace offered by author Sandra Byrd in our recent scavenger hunt. How many portraits are on the wall in the Tudor Hall on Sandra Byrd’s website? How many pictures of the Tower of London are there under the Castles and Palaces page of Sandra’s website? Who are the three Tudor queens whose stories are told in the three Ladies in Waiting Series by Sandra Byrd? – Anne Boleyn, Kateryn Parr and Elizabeth I. What Christmas treat was behind the door of No. 2 on the 2012 Anne Boleyn Files Advent Calendar? What is the quotation by Samuel Butler from the Quotes page on The Anne Boleyn Files? How many videos has Claire uploaded on to The Anne Boleyn Files YouTube Channel? Hello, Claire, just a quick question… Aren’t the portraits in the Tudor Hall 15 and not 13? Henry VIII, Katherine of Aragon, Mary Boleyn, Anne Boleyn, Thomas Wyatt, Jane Seymour, Kateryn Parr, Thomas Seymour, Edward Seymour, Mary Tudor, Edward Tudor, Elizabeth Tudor, Robert Dudley, William Parr and Helena von Snakenborg. I thought I’d put 15, sorry a typo! I was pleasantly surprised to learn of the win. 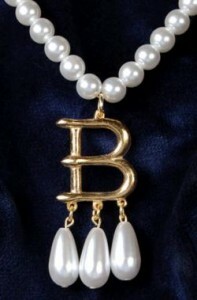 Am really excited to be receiving the the B Necklace replica and honoured knowing that it was highly favoured by Queen Anne. I think I shall buy a new outfit deserving of the necklace. :-). well done kerry and congrats.